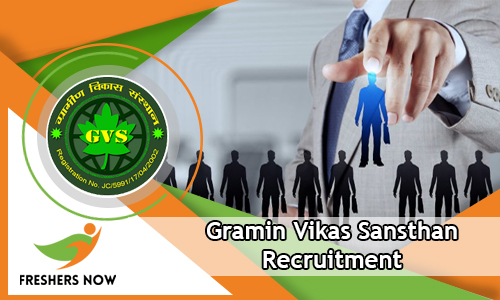 The complete information about Gramin Vikas Sansthan Recruitment 2018-2019 is available in this article. The officials mentioned that they are ready to select the willing contenders for 1100 Clerk, Manager, Peon & Other Vacancies. Moreover, the organization has given the entire eligibility criteria in the GVS Offical Recruitment 2018-2019 Notification. So, we all know that many of the aspirants are very curious to check the necessary information like Age limit, Age Relaxation, Selection Procedure, Application Fee, Education Qualification, Pay Band etc. Additionally, you can get the complete data from this article. We have attached all the details in a single place. So, all the interested and eligible people are advised to follow the below-given information. Meanwhile, all the applicants should remember that you have to apply before 31st March 2018 through Online Mode. Waiting to apply for Gramin Vikas Sansthan Recruitment 2018-2019? Then you have to start filling the Online Applications. Because, the Final Date to apply for 1100 Clerk, Manager, Peon & Other Vacancies is 31st March 2018. Right now, many of the contenders are showing their eagerness in checking the Eligibility Criteria. For those people, our main suggestion is you can verify all the genuine details from this post. So, finally, candidates belongs to Himachal Pradesh, Haryana, Punjab, Jammu and Kashmir State can apply now. Moreover, this is a marvelous opportunity for the candidates those who want to make their career in Government Field. As soon as possible check the data which we have mentioned in this article and grab the opportunity. Follow the below sections and get the depth information related to GVS Recruitment 2018-2019. Check the important details from the above table. To give the clear idea about Gramin Vikas Sansthan Recruitment 2018-2019 details, we have given a table and shared all the info on it. So, all the contenders are suggested to verify the above table and clutch the data. Meanwhile, the officials are strictly stated that those who have completed their Graduation Degree are eligible for Manager Post. Moreover, Inter passed students from any recognized university is the Education Qualification for Development Officer and Clerk Posts. Those who have completed their 8th standard or middle school passed are eligible to apply for Peon Vacancies. So, keep in mind that total 1100 Vacancies are available. All the interested and willing job seekers can apply for 1100 Clerk, Manager, Peon & Other Vacancies before 31st March 2018. And also, recheck the Eligibility Criteria details twice and apply. Candidates who are about to apply for Gramin Vikas Sansthan Recruitment 2018-2019 should have Minimum 18 Years and Maximum 40 Years. To get the Age Relaxation details go through the Official Notification which is available in the below section. So, all the people can go through the below sections and download it at free of cost. After completion of the downloading process, you have to refer all the information. We insist the people that don’t worry about the details because we are available here to share the accurate information. Many of the people want to end up their Application Procedure successfully before that you have to pay an Application Fee. General/ OBC students need to pay Rs. 350/- as an Application Fee. Remaining candidates belong to SC/ ST/ Female should pay Rs. 250/- as the Application Fee. Check the payment details from the official Gramin Vikas Sansthan Recruitment 2018-2019 Notification. After completion of the application process, all the contenders need to take a look at the selection procedure. Moreover, the organization of Gramin Vikas Sansthan stated that they will select the applications based on Merit List. So, there are not further rounds. You can happily apply for Gramin Vikas Sansthan Recruitment 2018-2019. Most of the people are liking the Merit Base selection procedure. For those people, the current Gramin Vikas Sansthan Job Openings is a best chance. Meanwhile, all the selected aspirants can get an extraordinary pay scale from the authority. Many of the beneficial factors are including in this Advertisement. Therefore, those who want to settle down into the Government Sector can happily apply for 1100 Clerk, Manager, Peon & Other Vacancies. For the sake of contenders, we have collected and attached the Official Notification in a PDF format. Those who have done their Graduation Degree can apply for Manager Post. Also, Inter passed students from any recognized university/ Institute should apply for Development Officer and Clerk Posts. Finally, those who have done their 8th standard or middle school passed are eligible to apply for Peon Vacancies. To get the Age Relaxation details go through the below Gramin Vikas Sansthan Recruitment 2018-2019 Notification. The selection of the candidates is purely based on Merit List. So, there is not further rounds. 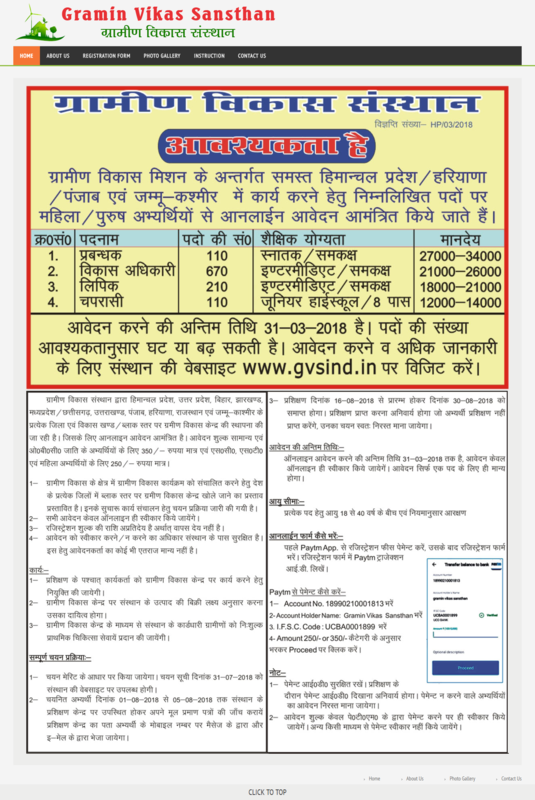 All the selected people can get an attractive pay scale from the Gramin Vikas Sansthan. To check the pay scale info just click on the below Gramin Vikas Sansthan Recruitment 2018-2019 Notification link and find the details. Here, we have given the easy procedure to apply for Gramin Vikas Sansthan Recruitment 2018-2019. Interested people, can check the below steps. We have given the entire information regarding Gramin Vikas Sansthan Recruitment 2018-2019 from the above sections. Visit our website Freshers Now frequently.